No. Our programs are designed for all ability levels. CrossFit can be done regardless of age, fitness level, or previous experience. We are located in the basement of a church at 221 Queen Street, on the corner of Queen and Clergy. The front door faces Queen Street. What is CrossFit? 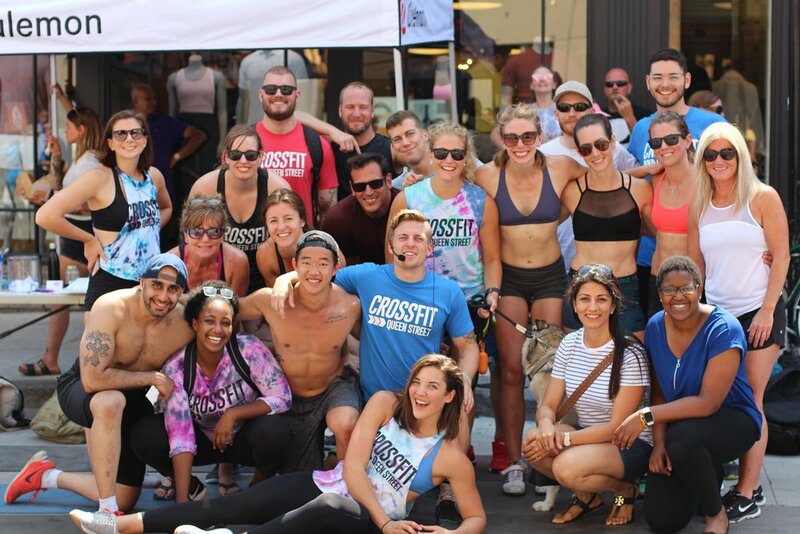 What does training at CrossFit Queen Street look like? CrossFit is a training regimen with the goal of creating athlete’s with the capability to excel in multiple domains (eg. gymnastics, weightlifting, rowing, running and other functional movements). This is achieved by providing workouts that have constantly varied movements at a high intensity. Here at CrossFit Queen Street, we provide a new workout in our 1 hour CrossFit classes each day that touches on multiple domains of CrossFit. Every class is led by one of our Certified coaches, whose number one focus is to guide and lead you through the workout. The coach will direct the class through a warm-up, general movement preparation, specific movement preparation, and then the workout of the day. It is a group setting, so you will never be alone! We encourage our members to join the group classes at least 3-4 times per week. Beyond this, members are welcome to use the facility anytime during opening hours and we provide direction on additional work that can be done to supplement the class workouts for members that are interested. Membership at CrossFit Queen Street is available to everyone in the community. Everyone who is new to CrossFit is required to complete our On-Ramp Program (more information here). The On-Ramp Program is designed to introduce athletes to the basics of CrossFit and prepare them to thrive in group classes. Once an athlete has completed the On-Ramp Program (or if they already have CrossFit experience), they can join group classes by purchasing a monthly membership. A monthly membership includes unlimited access to the gym for group classes and use of the facility during open hours. Our memberships do not have a minimum time commitment and athletes are welcome to go month to month as it suits their schedule and goals. More information on pricing can be found here. Do you offer open gym? Yes. Members are welcome to come use the facility anytime during opening hours (schedule here). Group classes take priority for space, but we have additional rooms where athletes can train during scheduled classes. If you have CrossFit experience, you are welcome to drop-in to any of our scheduled classes by signing up here. Your first workout is always free, and we have several options for short-term memberships if you are in town for a little while. If you do not have any CrossFit experience, you are welcome to come try any Thursday class for free- sign up here. There is street parking around the gym on Colborne Street and Clergy Street. Unfortunately we do not have our own parking lot. We accept credit, debit, and cash.